A short two-hour flight quickly and comfortably transports you to the white continent. On arrival you then switch to an awaiting ship, aboard which you’ll spend the next few days exploring and which acts as your floating hotel. What is a Fly & Cruise trip? How does a ‘Fly & Cruise’ Trip work? All Fly & Cruise trips to Antarctica start in the Chilean town of Punta Arenas in southern Patagonia, which you reach by flying via Santiago, Chile’s cosmopolitan capital. On arrival in Punta Arenas you’ll be met and transferred by minibus (20 mins) to your city centre hotel where everyone in the group will be staying, which is included in the price. The afternoon and evening prior to flying to Antarctica are taken up by getting your rubber boots, a mandatory briefing and then a convivial dinner, allowing time to meet your fellow travellers. Expect an early start the next morning for the flight to Antarctica. Actual flying time will be weather dependent. As a group you’ll be transferred back to the airport where you’ll check in and wait for your flight to be called. Once you’re airborne the charter flight takes approximately two hours to fly direct to where you land at the Chilean Eduardo Frei Station on King George Island in the South Shetland Islands, which are part of Antarctica but lie 55 miles/ 90 km from the actual continent. Having alighted from the plane, there’s a 30-minute walk downhill from the air base to the coast where your expedition ship lies at anchor, ready for your Antarctic adventure to begin. From this point onwards, aside from the return flight, your actual experience in Antarctica is exactly the same as if you had sailed to Antarctica. Once you’re settled in to your cabin and met your expedition staff, a daily rhythm is quickly established as you get used to life on board your floating hotel. All meals are taken on board ship. 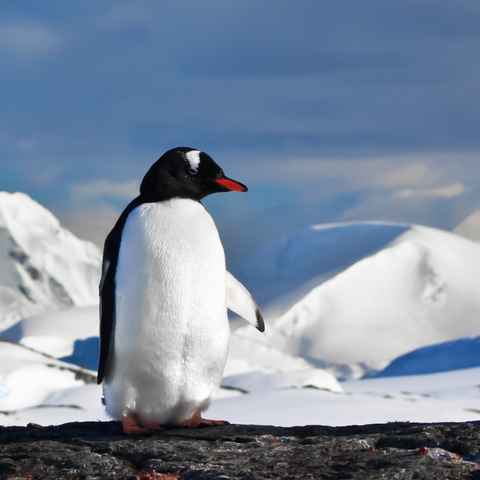 Typically twice a day you’ll leave the ship on 2-3 hour excursions led by polar experts, either visiting a penguin rookery, place of historic interest or research station, or go zodiac cruising looking for wildlife and photo opportunities. This is the best part! 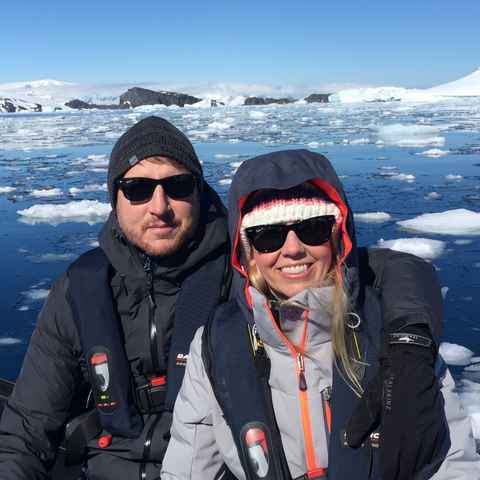 You'll be kept busy while in Antarctica with early morning’s and a busy daily schedule tailored to ensuring you get the very most from your precious few days in Antarctica. Interspersed between excursions and meals, there will be time to relax and also informative lectures. This Fly & Cruise formula has been successfully tried & tested over 14 seasons and in spite of the challenges of flying in Antarctica due to weather, over 80% of flights arrive on schedule. Fly & cruise worked very well and was a great option. All excursions were well organised and conducted safely. We enjoyed them all, especially the snowshoeing treks. Very closely met our expectations. Flying was the perfect option. Yes I would recommend. Antarctica is beautiful and amazing, and it exceeded my expectations. We flew over the Drake Passage rather than sailing it. The whole experience was wonderful. How much does a Fly & Cruise trip cost? Although on a per day basis a Fly & Cruise trip works out roughly 20% more expensive than a standard Antarctic cruise, the main benefits of flying - time saved and avoidance of getting seasick - more than justify the added investment. Excluded from the trip cost: International flights to/from Punta Arenas, any additional hotel nights & arrangements in Chile, optional adventure activities (e.g. kayaking), onboard staff gratuity (approx. USD$15 per person per night on board), travel insurance, items of a personal nature (laundry, bar tab or onboard shop). To read more about flights to Antarctica, visit our dedicated flights page. The standard plane used for the charter flights between Punta Arenas and King George Island is a British-designed BAE 146 which has capacity for up to 80 people and a seating configuration of 3+3. These planes are more ‘workhorse’ than luxury, but are perfectly comfortable for the short 2 hour flight. Their four turbofan engine configuration provides important redundancy and superior takeoff performance for short runways, both of which are key factors for flying to Antarctica. Demand for fly and cruise trips is high and they often get booked up well in advance. Most people book their cruise around 12-18 months in advance, before availability really starts tightening up. For the full choice of cabins and departure dates, we strongly advise you get in touch and start the planning process early. We also provisionally hold a cabin on your behalf for several days whilst you make up your mind. For speed, comfort and the avoidance of the Drake Passage, these Fly & Cruise trips are really hard to beat - I should know having personally worked on over 50 of these trips over the last six seasons. How can I guarantee a window seat? To get to Punta Arenas you first need to fly to Chile’s capital, Santiago, and from there take a domestic flight south to Punta Arenas. Santiago itself has good international connections with direct flights from New York, London & Sydney. Heading south from the capital, there are daily flights between Santiago and Punta Arenas operated by LatAm & Sky Airlines. Tip: make sure you're seated on the left hand side of the plane flying south for wonderful views as you fly parallel to The Andes. What is there to do in Punta Arenas? Punta Arenas isn’t a large city, but has a fair selection of things to do for anyone wishing to arrive early, including some notable museums. Can I spend longer in Patagonia? Given the time and effort to get there, we would heartily recommend adding on a few days at either the beginning or end of your trip to explore Patagonia a bit more. Punta Arenas is the gateway to Torres del Paine National Park, arguably the most spectacular and best known trekking mecca in the whole of South America. We can put you in touch with our sister company Swoop Patagonia who know this whole region like the back of their hand. Established over ten years ago, flying is an increasingly popular way to access Antarctica, particularly if you are short on time or concerned about the sea crossing.